The demon slayer known as Stoic sits on a beach in the Caribbean, but he's not there to kick back and drink fruity drinks. 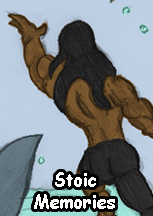 Pieces of Stoic's background are revealed as he battles a giant sea monster! Otherworldy activity in a southeastern state draws the attention of a demon slayer called "Stoic." With his mystical powers and a heck of a big sword, Stoic arrives to quiet the demon uprising... but the demons aren't the only ones unwilling to welcome him!